Having a mutated BRCA1 gene can mean a death sentence for those affected. Those with the faulty gene have up to an 87% lifetime risk of developing breast cancer and up to a 60% lifetime risk of being diagnosed with ovarian cancer. It can leave women with little choice but to go through major surgery to greatly lower their risk. Here, one woman, Carla Atherton, 35, from Saltney, Flintshire, explains how, on discovering she had the faulty gene, she went through a preventative double mastectomy in order to save her life. From a young age, I knew that cancer ran in my family. Not only had I lost my aunt and grandma on my father's side to breast cancer at young ages, but I'd also lost my grandma and, more recently, my cousin on my mother's side. Growing up, I suppose I had put this down to bad luck. But in February 2014, I received a text message from my aunt on my dad's side, who told me she had the faulty BRCA1 gene, and that I too needed to get tested. At the time, I had no idea what she was talking about, but I was soon to learn. All humans have the BRCA1 and 2 genes - they produce proteins that keep DNA healthy and stop tumours developing. But when the gene is mutated, it stops DNA from being repaired, allowing tumours to flourish. Knowing this, when I went for my own blood test, I was overwhelmed with nerves. But far worse was the six week wait to get the results. Although, statistically, I had a 50% chance of having it, I somehow sensed I had this killer cancer inside me that could strike at any time. But despite this premonition, when I did finally receive my positive result in the November, it hit me like a tonne of bricks. Statistically, I now had an 87% chance of getting breast cancer, and a 60% chance of getting ovarian cancer, on top of a high risk from my mother's side too. It felt like a death sentence and I made the decision straightaway to have a preventative double mastectomy. Despite being a ticking time-bomb, the first consultant I saw in Chester didn't seem to grasp the urgency. She just said I was young and healthy, so didn't need to rush the mastectomy. It was so preposterous that I asked for a referral to Dr John Murphy at Wythenshawe Hospital in Manchester. He took one look at my family history and slotted me into his next available surgery. This was August 2015, nine months after my positive result. To say it wasn't a great experience is putting it mildly. I had opted to have reconstructive surgery as part of the operation, but got an infection, meaning I had to take four months off my job in project management. The time was made trickier by the fact my mum was diagnosed with breast cancer - she's now two years into recovery - and my cousin, then aged 36, had just died from breast and cervical cancer, just a year after being diagnosed. She never knew if she had the BRCA gene or not, but I felt so terribly guilty that I had a second shot at life by having an operation and she didn't. The one saving grace was that losing my breasts wasn't as hard as I'd thought. I had predicted my confidence would be dented, but in fact I gained confidence, knowing I had slashed my breast cancer risk down to about 5%. But, while the decision to have my breasts removed was relatively easy, it was a different story with my ovaries. I couldn't imagine a life without having children, so despite the risk involved with keeping them, I chose to delay removing my ovaries. Now I'm 35, and am about to embark on IVF with my long-term partner for our first child. This way, any embryos we produce can be screened for the BRCA gene. Quite simply, I could not put a child through this. Should I get pregnant and give birth, I will then have my ovaries removed immediately, as I know my risk of getting ovarian cancer is still very high. Going through this journey has also inspired me to help others. Although the gene has been thrust into the media spotlight due to the actress Angelina Jolie's own surgery, there still needs to be more information and counselling for those affected. Consequently, I have set up a BRCA and High Risk support group on Facebook, which has nearly 900 members worldwide. I've also started a meet-up group in north Wales, and set-up my own blog. 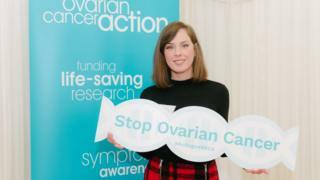 Last October, I was part of a team who presented a policy paper published by Ovarian Cancer Action to the Houses of Parliament. It called for better awareness and testing of the BRCA gene, and also increased counselling. The BRCA journey is one that's very hard to face alone, and with increased testing in Wales, it's one more and more people will go through. Since NICE guidelines were introduced in 2015, Wales' position on testing has been the same as that of the rest of the UK. Women and men with a strong family history of cancer at young ages are offered the test, so they can take preventative action. About 97% of those who are tested receive their results within seven weeks. Women and men who are worried they might have the gene, but are not eligible for testing as their family history is not strong enough, can pay for the test privately, at a cost of around £500.